and etched as much copper as would sheathe the British Navy." 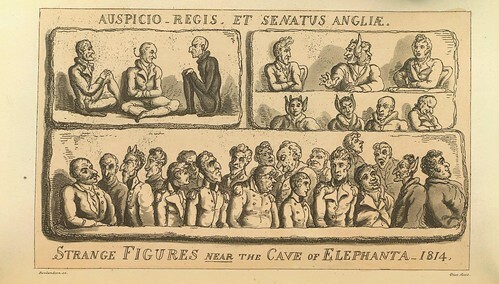 During his career, Thomas Rowlandson (1756-1827) produced some ten thousand engravings, etchings, ink and watercolour illustrations, in the era known as the Golden Age of British illustration. 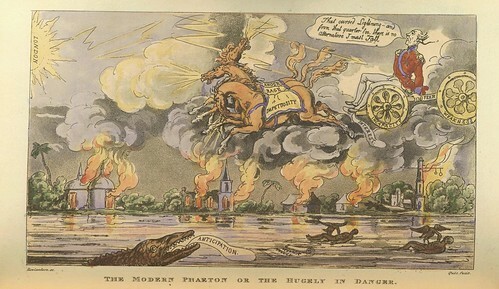 His satirical prints were generally funnier than his predecessor, William Hogarth and less overtly political than those of his friend and fellow Royal Academy attendee, James Gillray. 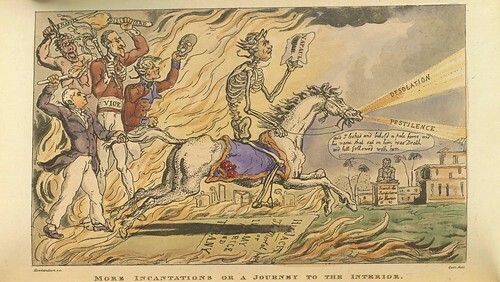 Rowlandson provided the illustrations for a series of books in which Dr William Coombe contributed the accompanying verse. 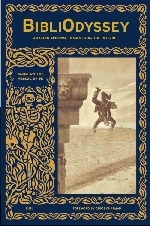 Most famous among these was the 2-volume work, 'The English Dance of Death' (see previous entry). 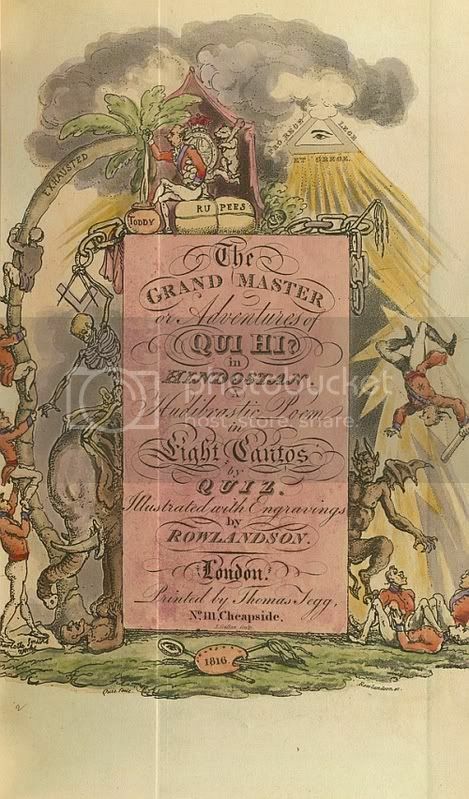 There was also the recurring character of Dr Syntax together with a final collaboration, seen in the illustrations above, in which it is presumed that 'Quiz' is a pseudonym for Coombe. It hardly matters - see a random snippet of the lacklustre verse below - as it was Rowlandson's comical illustrations that attracted the public and for which any of the books produced by this partnership are remembered. 'The Grand Master; or, Adventures of Qui Hi? in Hindostan. A Hudibrastic* poem in eight cantos by Quiz. 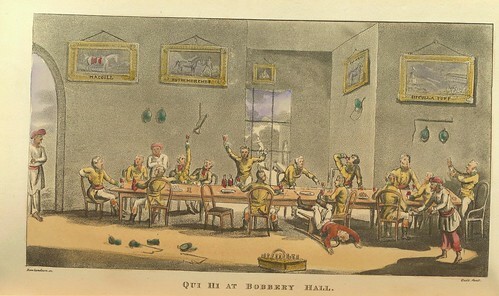 Illustrated with engravings by Rowlandson' was released in 1816. 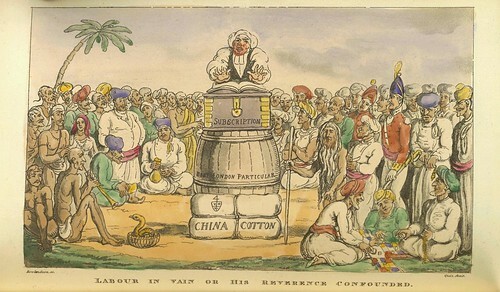 I'm not overly sure I picked up the plot elements, such as they are, but Rowlandson's satirical blade cuts much more sharply upon the British colonial mindset in India than in any of the simplistic caricatures of the local inhabitants. 'The Grand Master' is online at Posner Library in a page-by-page arrangement. All of the large versions of the images above were reduced in size somewhat (but are still very large), as Posner's huge jpeg files lose some of their quality as full enlargements. 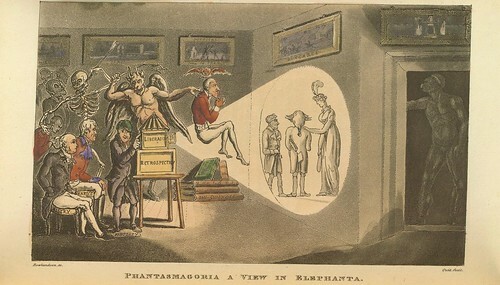 The balance of the illustrations in the book have been uploaded to this Webshots album. 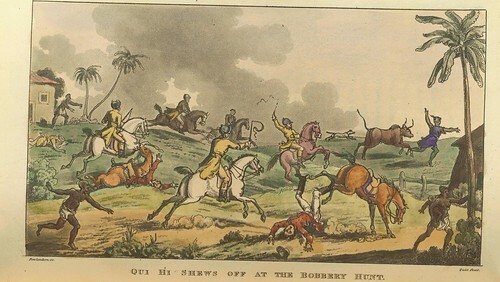 'The Pursuits of Pleasure Thomas Rowlandson's satirical view of Georgian society' by Robert Hughes (1990). 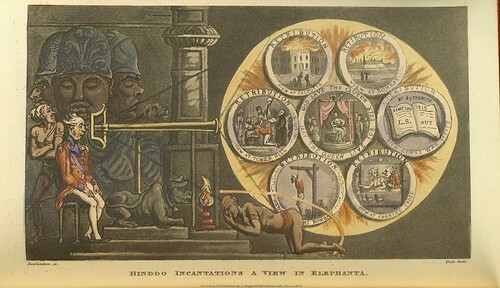 These previous comical histories may also be of interest - Rome/England. 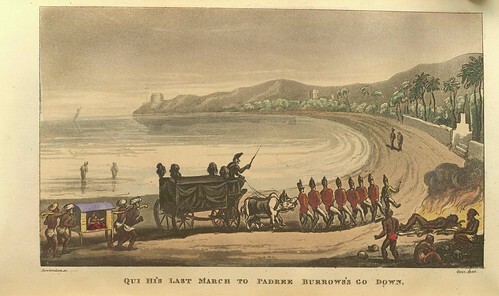 Fort William, by the shortest rout. Crowding by thousands in the street! 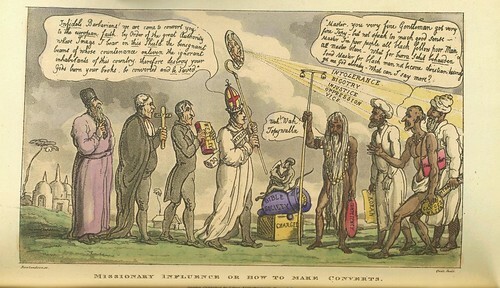 As much as I love Rowlandson's pictures, he was merciless in his caricatures, and often vicious. 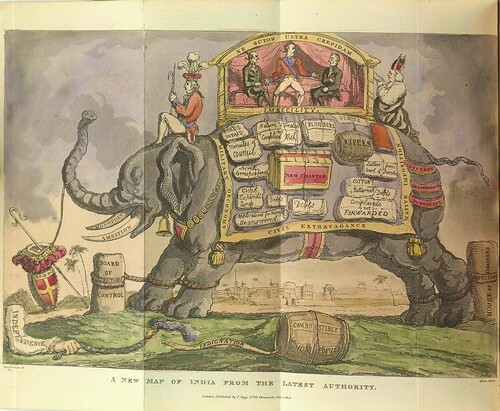 As a BritCit the history of the British in India was part of my schooling. 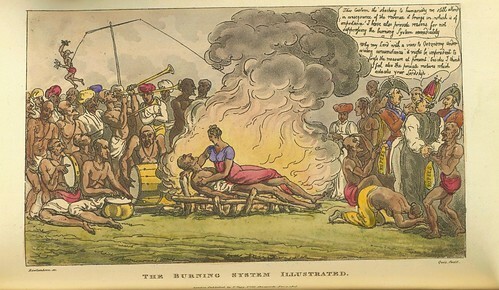 The Black Hole of Calcutta was a notorious incident of brutality, and the juggernaut, which, if memory serves, carried the thughee idol, would not stop even though it rolled over unfortunates who fell (sacrificed themselves?) in its path. 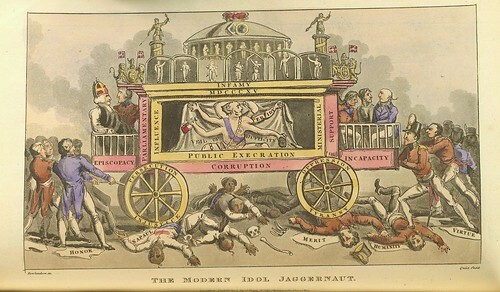 W: Black Hole; Juggernaut (Jaganath); thuggee. I don't see the 'viciousness' in the caricatures myself, particularly if some level of leniency for the time period is allowed. I'm not qualified to argue other than to note that the overall impression I got was that this work was a broad brush mockery of the attempts at insinuation of British interests - often financial/political - into the subContinent. 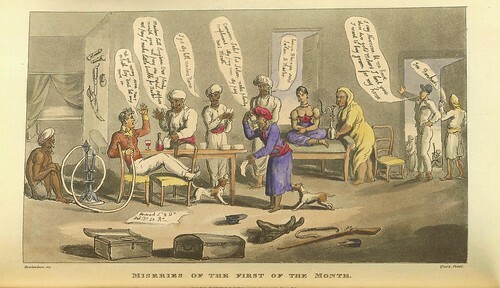 But I admit to ignorance for the specifics so some of Rowlandson's illustrative tactics may be whooshing past my ears. Whoops, sorry Alan, I think I removed all your comments when I was getting rid of the double. You asked approximately: "can I use one of your images in my blog title". My answer is that I don't own these images. If you want to be very correct about it, you would need to ask permission from Posner Library. But I think that it is a matter for you - the illustrations are out of copyright and I think it is very very very unlikely that anyone would object to you using the image.